Cost to get there: I met this guy near the beach and negotiated taking me out to kart, waiting, and the return, all for 300 as I recall. Which at this point in my trip was decidedly a pretty good deal. Cost: Unfortunately, as can be seen above, that’s the only pic I’ve got! 10 minute races. 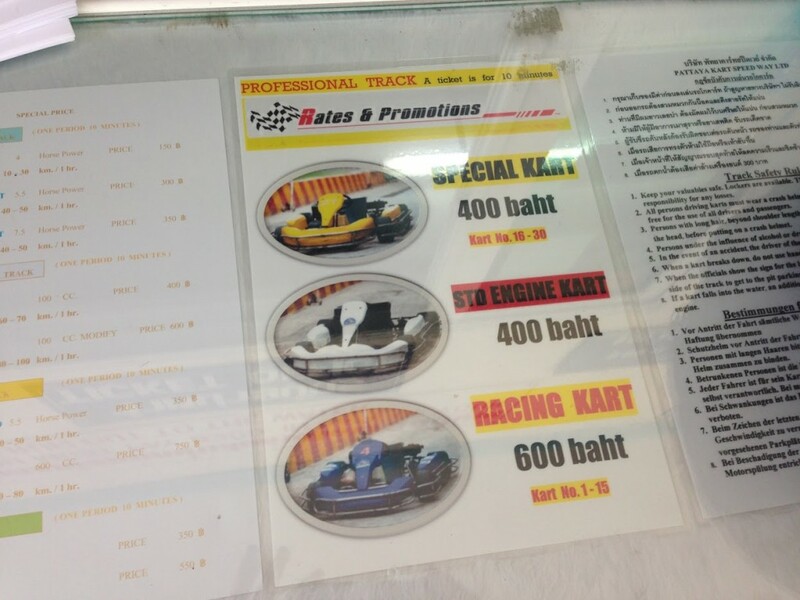 Apparently there are 125cc cars that can be requested that run 1200 baht, although this is unlisted on both their site and their website. Pretty good pricing here for these karts and sessions. Track: A simple but fun outdoor track. I’m thinking that you probably don’t have to actually brake or slow for turn 1 but I never got up the courage to try it before leaving. Karts: I believe these are 100cc 2-strokes. I drove the karts just fine although recall thinking they could have felt a little better braking. Overall: A nice track and fun place to kart with nice affordable 100cc rentals. I much prefer the 100cc 2-stroke Thai standard vs. the other apparent Thai standard of 270cc 4-strokes.